Yes. I found the answer. It was July 2011 for Philly. Still doesn't change the fact your winters are much colder than ours as I have pointed out. That's obvious. We are vastly more continental then Philly, and slightly more northerly as well. What wasn't obvious to me (which is why I asked) was the fact that even though Philly has a slightly higher average maximum temperature then Chicago during the summer, it turns out that Chicago has recorded a higher absolute maximum temperature, and a higher average monthly record monthly temperature. The winter of 77 is legend around here, and the fact that that is not out of the ordinary for Chicago tells me all I need to know about your winter. If you are not a cold weather fan, then Chicago winters are probably too harsh for you. Though someone from Bismarck or Minneapolis would chuckle at our "harsh winters". Not too surprising, since Philly is less continental. 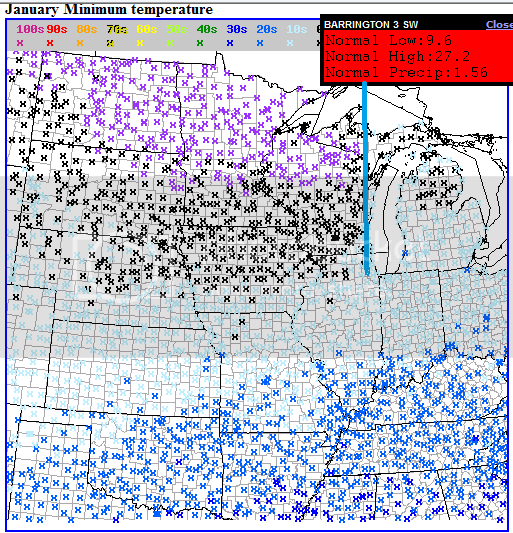 In contrast, North Dakota has recorded 121°F despite cooler maxes than Philly. Yeah, our record highs are not that impressive compared to the Midwest. Our local meteorologists explain this usually when we get a heat wave. We are 55 miles from the Atlantic. It prevents the summer temp records from getting Midwest type hot. Despite the fact that hot summer winds from the SW, somehow the ocean has an influence just sitting next to that giant cool mass of water does it. Chicago. Much more sunshine and better seasonal variety. Chicago is also tempered by a large cool body of water which is why we are not nearly as continental as the Plains. Are you sure all of North Dakota has lower average maximum temps than Philly in the summer? I thought there were a few stations with average highs in the upper 80's in July. I'll diuble check. I know South Dakota has many stations with higher temperature, at least in July. The warmest average maximum temp I could find in North Dakota is indeed a couple of degrees cooler than Philly in July. 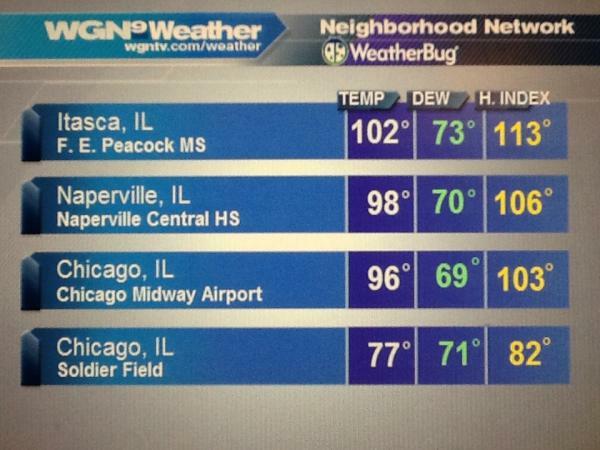 Back to Chicago, our lake certainly does create micro climates as the article above indicates. Here is an example from July 2012. Within a 25 miles distance from Soldier Field to Itasca. Coldest average minimum temperature that I could find around the Chicago area is in "ritzy" northwest suburban Barrington. I presume oceanic or warm winter weather lovers would find this a bit too frosty? Warmest July maximum in the Chicago area would be found in the Fox Valley suburbs (2-3F warmer than O'Hare and Midway).... Wheaton I believe has one of the highest (and similar to Philly which is 87.1F). Seems London loses every climate battle.